Buddhism's Four Noble Truths state that "suffering is caused by craving" and "ends when craving ends": so you've got nothing to worry about, if you've just destroyed a plate of Curry Shrimp in Banana Leaves alongside a giant statue of a certain Siddhartha Gautama. 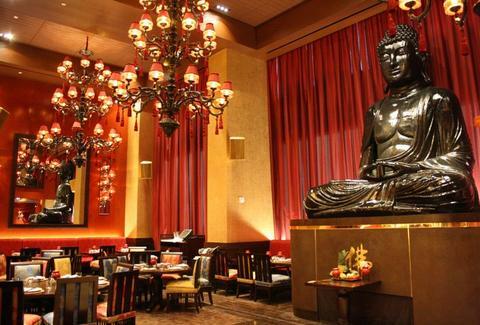 Live that noble ideal, at Buddha Bar. A much-anticipated Parisian import, BB's DC incarnation's a massive, elegantly gorge-worthy nirvana, with a front 50-seat lounge and 20-seat bar beneath a massive Asian dragon tattoo-mural, and a sprawling main dining room feng shui'd out with classy chandeliers, silk drapings, and the eponymous centerpiece: an 18ft tall, "onyx black"-finished Buddha, blessed in a pre-opening ceremony by monks, drummers, dragon-dancers, and a martial artist after flying "10,613 miles from the jungles of Indonesia"...and boy were its 10ft-long divine arms tired! The French-influenced, pan-Asian deliciousness comes via a Korean-born chef, with cooked grub including roasted black cod, Five Spice Chicken, wok-fried beef with basil, and a candied fruit-accompanied "lacquered Peking Duck", sure to varnish right before your eyes. More edible goodness, like the aforementioned, will largely follow Paris's menu, with sushi like a lobster roll and black sesame Tuna Tataki, while booze includes 27 premium sakes (two sparkling), and a 20-strong specialty cocktail list with highlights like the Stoli Vanilla/pear/Serrano chili peppers Burn, and the Apple Pucker/vodka/passion fruit/strawberry liquor Fire Buddha, which hopefully wasn't done without a generous reverence package. In the coming weeks and months, Buddha'll veer off the Parisian menu, adding/subtracting dishes and cocktails to give the joint a "DC twist" -- also the name of your one of your more bizarre cravings that may never be satisfied.